Avowed finally has a release date! It will be available for Kindle on 03/06/2018 with a paperback version to follow shortly. You can also pre-order the Kindle version on Amazon for only 99 cents! Violet has always felt unseen. As a younger daughter of a powerful fae family and one of the famed terre-verde sisters, she’s never stood on her own. Shy and unassuming, Violet envies her older sister Liliana’s passion and purpose. It isn’t until she meets Beorn, next in line to be king of the fera, that Violet feels truly seen. Wild and rebellious, Beorn is more interested in antagonizing his father than in his responsibilities to the fera. Consorting with humans is bad enough, but when Beorn falls head over heels for the daughter of another fae house, he knows he’s risking far more than just his father’s anger. When Liliana chooses to renounce her magic in order to marry a human, the entire fae realm is thrown into turmoil. As lines are drawn between houses, can Violet and Beorn’s forbidden love withstand those who would seek to destroy it? 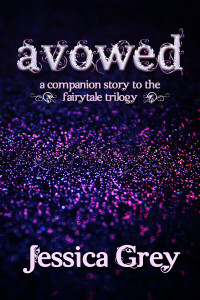 Avowed is a 29k word companion story novella to the fairytale trilogy. It takes place chronologically before Awake: A Fairytale, but can be read at any point.